Celebrate the iconic helmsman of the starship Enterprise with the Star Trek Sulu Collector's Pin. 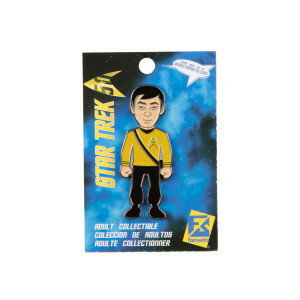 This 2" tall pin featuring the Sulu is a must for your collection. Hello to all and Merry Christmas!!!!!! It the first time I buy the pins and I love them as well as the badge. I have bought from you before and it has been a good experience. As stated before I love the pins and I know that as soon as I can will get the others as well as some other merchandise. Again have a Merry Christmas and a blessed and Happy New Year. God bless you all, and one more thing, do not forget the reason for the season, that is Christ, without him there would be no Christ-mas.